We are currently experiencing a drought in our part of the country and if I had collected my tears in some type of container, (an incredibly large container), I think I personally could have solved the problem two days ago. Today is a better day although it was quite painful walking into the house and past my son’s room. This picture is of the two OS and me while still at West Point featuring four items of USMA gear along with the jade necklace my friend whose husband is serving in Korea. The last thing I want to be is maudlin so I’m concentrating on good things. I don’t even like the the word maudlin, therefore I’m trying my best to not be characterized as such. and reading Absolutely American (an amazing West Point book, highly recommend) and sporting my West Point Class of 2012 baseball cap. along with an Army lapel pin. Can you notice a theme here? Does it seem just a little over the top? Who cares! In some way, it connects us. 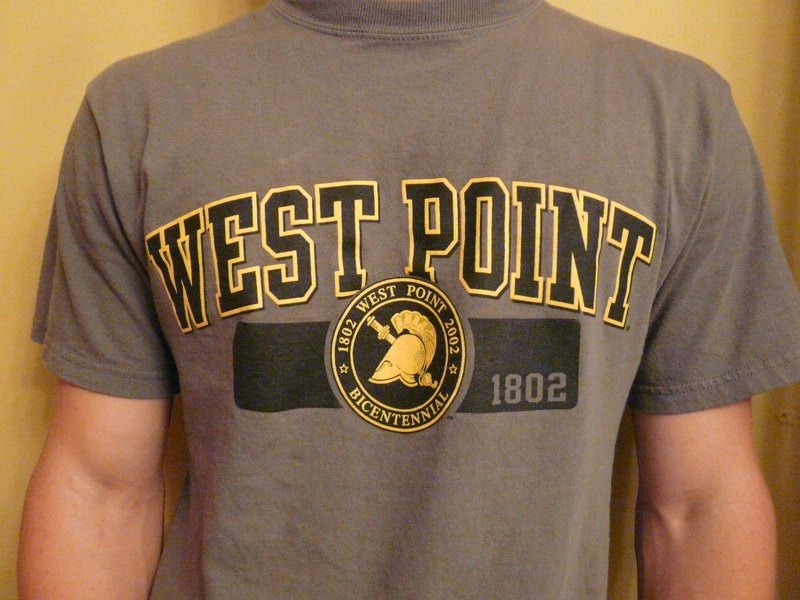 I might wash my West Point Mom shirt in a couple of days if it starts to stink but I will stay in the laundry room and put it on as soon as it comes out of the dryer. Do you think I’m kidding!? I’m not! Despite hundreds of miles that separate us, I am tethered to my child by these small efforts. Since I like to sew, earlier this spring, I made Isaac a pair of camo-boxer shorts and a camo-pillow case. My nephew Josiah now has a camo-bib. I also sewed a camo-apron. Suddenly my favorite colors are either red, white and blue or black, grey and gold. I can’t be there with him while he is learning “knowledge” or doing push-ups or making his bed with incredible speed and execution so in spirit, this is my mama’s way of showing support. He doesn’t know it but I do and it makes me feel better = less tears. I cried so much on Monday that I had salt deposits under my eyes. My two OS said, “Mom you have this white stuff under your eyes.” I went to the restroom at West Point and it wasn’t Kleenex, it wasn’t makeup, it was dried up tears. Yeah, it was that bad. While at the Panera Bread line today, wearing my West Point Mom Class of 2012 t-shirt, a man approached me and said that he used to attend the Sunday night concerts up there by the tip of the Hudson River. I saw that place just a few days ago and it brought me a measure of joy. I felt connected and held back the floodgates. During this time of transition though I have to share this with you. I haven’t been able to collect my tears and find a useful purpose for them but someone has. I can’t tell you how many times I have clung to that truth. If you know people who are hurting, sad or lonely, share that timeless message with them. God is recording their tears in His bottle, on His scroll. They matter to Him. And if you see me, for goodness sake, please compliment me on my new USMA fashions, it will help this mama of a soldier! Check out how things are going as we now await “the phone call” and a silly way we included our NC into a little family fun! Link to a newscast about R-Day at West Point, I wouldn’t have lasted 10 minutes! Btw, I love all your comments and stories and want to put them in a future post. They are inspiring even to non-military folks! Keep ’em coming! Two things – you may not have lasted through R-Day, but you are most definitely “Army Strong.” A lesser mama would be in bed for the next month with the covers over her head.And, the new layout/background is bee-utiful! Just wanted to say I loved your post and am going to put a link to it in our next electronic newsletter! We met a lot of parents like you at Ike Hall on R-Day and you touched all our hearts! Your son is in good hands here! The best thing you can do for you son now is to write him constantly. The first few weeks are the toughest but a letter a day will help him through the hardest parts. Don’t put any pressure on him just tell him you love him, you are proud of him and that he can get through this no matter what. Believe me, I know I was in his place 25 years ago. You will also get through this and fine that the young man you see next time will be a different individual. Remember, you got him there, now he has to carry forward from that point. Take care. As a member of the class of 1990 I agree 100% with John’s posting. Support him, but don’t pressure him. He will succed if he wants to, not because his familty wants him to. I know lots of my classmates who quit becasue they were there for others,not themselves. Be proud, he is one of America’s best, in this day and age of self-centered all about me attitudes…. his self sacrifice for our country is appreciated. Also a member of the class of 1990, I would give you a few pieces of advise. Write your son every single day. That will do wonders for both of you. Get him a subscription to your local newspaper. Next, I always read Proverbs 24, particularily the 16th verse. As a Category 3 heatstroke victim my beast summer, this passage has meaning for me. Your son will have hardships, he may even fail at something. Just always get up and try again. Be strong for him. Plan some fall visits and stay a little longer than the weekend. Hope this helps some. I love your blog. Wish I would have thought of it. Hang in there mom, it does get better! I was there last year. Every R day picture my eyes were red and swollen. I functioned at work like a zombie. My cell phone attached to my hip 24/7 waiting for that oh so rare phone call. We too bought all the decorations for the car and house as well as clothes. Somehow it did make us closer to my son. Funny though, when he returned for Christmas his comment was “enough already” I live it every day, please no more!! ha hah…..so, as you see he had some real challenges first year and often wondered what he had done! As others say, support and listen, dont fix (I tried to do that and you cant!!) As for BEAST….write every day. It will help you and him. Long or short it didnt matter. He loved them and said it made him feel loved when he saw the envelopes. I even resorted to handing out the addresses to anyone who asked about him and to my surprise most of them wrote him. Sometimes I would write about the annoying dog next door or the local football hero who was his best friend he left behind. It didnt matter, one lines, two lines, words of wisdom, just write! Hope this helps. Know I am thinking of you and IT DOES GET BETTER! Cant believe I am saying that. Get ready for a year long rollercoaster ride (which I hear is normal). Maybe you will be lucky and not have to endure this but for most it is there. The first year challenges that dont look so bad now that he is no longer a plebe. Take care!! I guess everyone is different….my son asked to save all of his letters when he brought them home at Christmas. And…he will not be any weaker of a man for that! I guess parents all have to do what is best for their kids and their different personalities. Just hang in there mom, it does help!! And for some, they really enjoy hearing what is going on and knowing that what they left behind is still there and not changing too much without them. Wow – You brought tears to my eyes remembering my son’s first year at West Point (Class of 2010). I had forgotten the emotions you go through. That jungled up mix of sad,pride,worry,and just plain missing him. It gets better, I think I regained my emotions around October that year. Don’t be disappointed when/if he rejects all of your Go Army stuff, just go with the flow. I think one of the biggest lessons for us to learn was to not get drawn into the hype and to keep it real for him and for us. He sees himself as just another kid going to college and hates to have anyone make a big deal about it. Good luck and God Bless you and your son! My husband and I dropped our oldest son at West Point this year also. When he hugged me good-bye he told me he was more worried about me than himself and that he didn’t want to see me cry. When we left him he was a joking talkative kid with a lot of thick dark hair–it was really hard to see his transformation at the Oath ceremony…no hair..awful glasses..but we were so proud of who he had become and the choices he had made. When we got to the car, my husband and I both fell apart..one of the hardest things we have ever done. I was thrilled to find your blog as I was searching for my son in CBT pictures. It somehow helped. I hated that first year. I, too, want to strongly suggest that you write your NC everyday. My very unsentimental daughter also brought all the letters I wrote her home to keep. When you start running out of material, go online and look for jokes and funny stories. I Googled military jokes and only sent the best ones; some poking fun of the Navy and Air Force. 🙂 I know it seems far off, but if at all possible go for A-Day. It’s a once in a lifetime event that will literally take your breath away. And yes, the tears will flow. 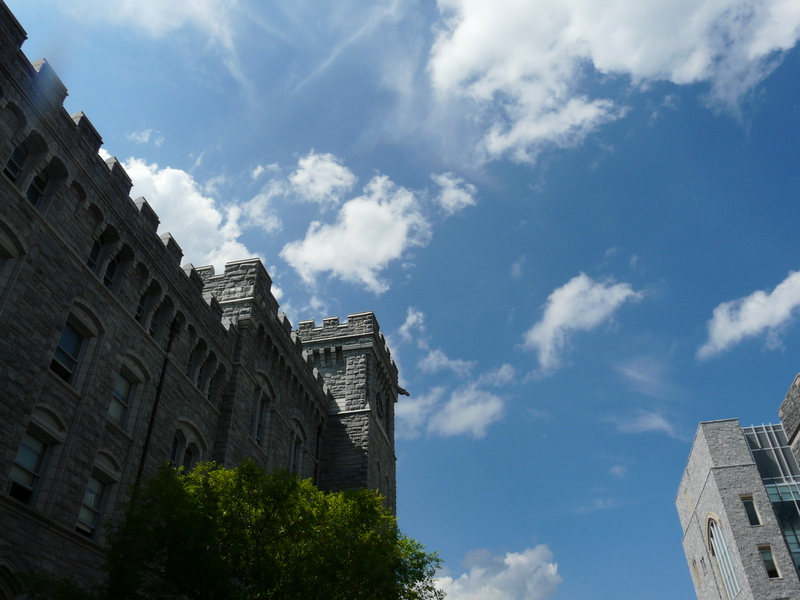 Sign up for Plebe-net at http://www.west-point.org/parent/plebe-net if you haven’t already joined. I wouldn’t have survived last year without it. Take heart – once Beast is over you’ll have more contact with your son/daughter during the academic year. Buy some more tissue. I am the mom of a 2008 grad and used more than my share spilling tears of pride and joy at graduation last month. My advice is to go there as often as you can. Attend football games, plebe parent weekend, go to Sandhurst, and don’t miss ring weekend.I envy your next four years. Enjoy them and congrats. I can relate to all of these wonderful comments; I left TWO cadets there (brothers), and I have cried twice as much as I thought I would. Even though I am terribly proud of both, at the same time I am sadder than I had thought I would be. My husband is a marine, and separation is not foreign to me, but when it is your boys it is completly different. I continue to write them on a daily basis, which helps me as much as I hope it helps them. Hang in there everyone; they are in a great place! As a recent graduate, I can see how your reactions are very similar to those of my parents who were incredibly supportive of me. I wanted to quit every day during Beast and most of plebe year. Love and affection from family is critical. Encourage him to attend religious services, as those were essential in helping me get through those tough weeks. As the expression goes, There are no atheists in foxholes (or during Beast).Also, don’t forget the other kids though. I was the youngest and I definately experienced resentment from my older siblings as my parents had USMA/Army/ West Point everything. My siblings are proud of me, but I do feel that they are resentful. Make sure that you remind you other sons that their accomplishments are just as important to you. Your son getting into West Point is impressive, but so are your other sons’ other achievements.But I appreciate all your support!Thank you. And I wish your son the best of luck! I enjoyed reading your blog and the comments about R-Day and would like to share our somewhat unique R-Day CBT experience. Our son is in the class of 2010 and is presently a first detail squad leader for “Beast” (yes, he was one of those cadets on R-Day). However, we consider it a miracle that he is there at all. You see, less than four months before his R-Day, he was accidently stabbed in the chest with a hunting knife and underwent emergency open heart surgery. We nearly lost him. As a result, he was medically disqualified for the academy. Nevertheless, he didn’t give up. He worked hard to recover from his surgery and get back into shape. He applied for a medical waiver which was granted three weeks before R-Day. In spite of the pain from his surgery, he made it through “Beast” and his Plebe year. He is now going into his Cow year and has been on the Dean’s List every semester. I share this because we feel this story can serve as inspiration to others. Support your new cadets with letters and words of encouragement. All can succeed of they want to bad enough – our son is proof. Good luck to all. Go Army, Beat Somebody! Reading your posts about West Point brought back so many memories. My son is also a cadet at West Point, in the class of 2011. He’s the 2nd of our five children. Like you, my number one goal is to raise children who love Jesus, and are useful to Him, in whatever he’s called him to do. It’s refreshing to read your blog, and realize that there are others out there with whom we have so much in common. Thanks everyone for leaving comments! I love it but can someone tell me where you all got the link? I think there is an electronic newsletter but what newsletter? Just curious, thanks! Twenty years later, I still have all the letters my mom sent me during Beast and my entire Plebe year tucked away in my footlocker. That is awesome how you kept those letters!! I knew they would be important to some! I know they are to my son. I enjoyed reading your blog. I had my R-Day long before there was any internet (I graduated from USMA 1965). All I can tell you is that the first 7 weeks are the hardest but even the academic year is not easy. Time management is critical. I concur with many of the other comments-write every day (he will not have time)but will find time to read the letters. When he does have an opportunity to call don’t be discouraged if he tells you that he hates it there and maybe might even want to quit (I told my parents that). Regardless, tell him to take it one day at a time and finish Beast Barracks before making any decision. It will all work out. I connect with you and the many folks leaving comments. Psalm 56:8just spoke to me and comforted me, because I believe I still feel the resentment of my siblings after 25 years! Yes, I’m a grad too and had a wonderful class to go through Beast with. I recommend you write letters to your son, but cherish the two sons at home just as much. They are watching you. I can so understand your feelings! I, too, came home feeling the exact way in 2005, upon our our return from R-Day. My son just wrapped up his 3rd year at WP, and he is home for his summer break at this time. He spent 10 days in France with a couple of professor’s and some fellow cadets, and on July 20th, he will fly out to Korea for about a month, before he starts his final year at WP. I am honored to say that he is from the Class of 2009, and looking forward to his commencement ceremony in May of 2009! I am a “Proud Parent”, yes, I am!! I carry multiple stickers on my car, his step-dad does too, and so does his dad….not to mention, the West Point Flag that proudly hangs on our front yard! We are definitely “Army Strong”! I just found your blog and am excited to read it! Our son, James is also a new cadet in the class of 2012! We are also Christians.I was checking out new Basic Training photos before doing my devotions for the day and I clicked on your blog. Can’t read it now, though, but am anxious to return to it in the near future. We were encouraged to have met two other Christian moms when we took James up for R-Day. My husband, who is the Assitant Pastor and teacher at Canaan Bible Chapel and Academy, also has a blog (www.thehokeypokeyplace.blogspot.com). I will be reading your blog daily form the first entry to present. My email address is merrilyrowyourboat@hotmail.com. Thanks for the time you put into wrting a blog. R-Day for me was 3 July 1967. Had personal computers been available then, I’m sure my late Mother would have written a blog very similar to yours. Stay strong for your son – he will need your support. Plebe Year is a long haul in one sense – and yet a blistering blur in another. Fifty plus thousand have preceded your son – here’s wishing him the best as he earns his place in that hallowed fellowship known as the Long Gray Line.